Last Friday both Spice and Tata Indicom launched dual sim phones in India in Association with Samsung.Increasingly it is felt that one handset per person is not enough, increasingly many are toting around two phones — one for work and one for private use. these dual sim phones might help get rid of the problem.”The Dual SIM phones contain 2 SIM slots, unlike normal phones, which have only one. What’s more, users get a call waiting tone if another call comes on the other SIM and can either swap or reject the other call. Thus, both the SIMs can remain active at same time.These phones are already available in korea and China and now they enter India. 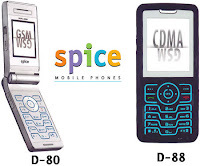 Spice Mobiles have come with the Spice Dual D-88 and D-80 mobile phones through which you can carry two mobile phone numbers in a single handset. The Spice Dual D-88 supports the combination of GSM and CDMA technology, while the D-80 can be used with both GSM providers. The D-88 is already available for a price of just below Rs. 10,000 while the D-80 is going to be launched soon. The Spice Dual handsets have a sleek and slim body with a 2,62,000 TFT and a 2-inch color screen. 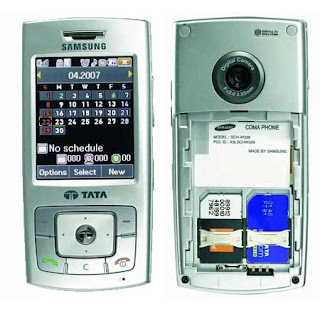 It also comes equipped with a 1.3 megapixel camera with a 256mb memory card. Meanwhile Samsung also launched touchscreen based dual sim phone with Tata teleservices for Rs 11,999 .The phone also features 2.2” TFT touch screen, 1.3 mega pixel camera, Micro SD Card Slot, MP3/ AAC+ player with A2DP Bluetooth support. Samsung said that the Samsung Duo phone also packs in handwriting recognition, file viewer, sketch memo, organizer and India specific applications like Indian calendar, cricket scorer. Tata added that the phone would support data speeds at 153kbps on Tata Indicom network.